04/24/2018 UPDATE: Fortunately the Shang Shung Institute School of Tibetan Medicine has launched a new 900 hour training on Massage Therapy and Tibetan Kunye External Therapies. This is the most extensive training we know of in the WORLD! It prepares anyone for a career in massage therapy with a specialization in Tibetan Kunye External Therapies. Check it out here! Most people appreciate a great massage to soothe muscle pain, relieve stress, and restore from fatigue. How nurturing and therapeutic! Massage is actually one of the most ancient and elemental methods of treatment in human history. It requires no equipment or technology, beyond the application of our intuitive knowledge and our physical bodies. Although it is very simple and natural, as many of us can attest, massage is extremely effective. Even just a few minutes of massage can shift our stressful, tension-holding state into a relaxed and soothing state. It can “switch on” our natural relaxation and restoration functions, and “switch off” our stress mechanisms. An extended massage session with an experienced practitioner can simply work wonders, leaving you feeling amazing. Most ancient medical traditions, from around the world and throughout history, include their own system of massage therapy. Tibetan Medicine has a fantastic tradition of massage and gentle therapies, known as Kunye. Kunye is the ancient form of massage therapy taught in Traditional Tibetan Medicine. It is an effective, dynamic healing art. Presented in the classical texts of Tibetan Medicine, Kunye has been transcribed and formally taught for many centuries. The term Kunye comes from two Tibetan words: “ku” means oil, and “nye” means to perform massage. So fundamentally, Kunye means “applying massage with oil”. In this article, we will discuss the format of Tibetan Kunye Massage, what it includes, and some of its benefits. First, oil is generously applied to the body. For best results, we use heavy, sweet natured oils such as olive oil or even clarified butter. In fact, traditionally in the mountains of Tibet, clarified dri (female yak) butter is used, and is believed to have fantastic therapeutic properties. We also use oils infused with various herbs. We choose which kind of oil to use based on each persons individual constitution and symptoms, as well as factors such as the season, local environment and other conditions. Next, a variety of massage strokes and techniques are employed. Extra attention is paid to the hands, feet, head, and the “special points” described in the classical texts of Tibetan Medicine. Kunye Massage generally starts slow and gentle, working up to more vigorous action and deeper work on key muscles and specific points. Kunye also employs techniques of assisted stretching and joint mobilization. In addition to oil massage, Kunye also utilizes a variety of gentle therapies. In this way, we can use additional techniques, tools and topical herbal preparations to enhance the treatment. The additional therapies used in Kunye are mild and non-invasive, generally very relaxing and enjoyable. These gentle therapies, combined with massage, produce fantastic results. So Kunye includes a dynamic system of therapeutic techniques. A few of the more common therapies are described below. Hot stones are used extensively in Kunye treatments. They are smooth, heavy and retain heat very well. This makes them ideal for use as heated compress or as manual massage tools. We often wrap one or several hot stones and place them over areas of pain such as the lower back or shoulders. 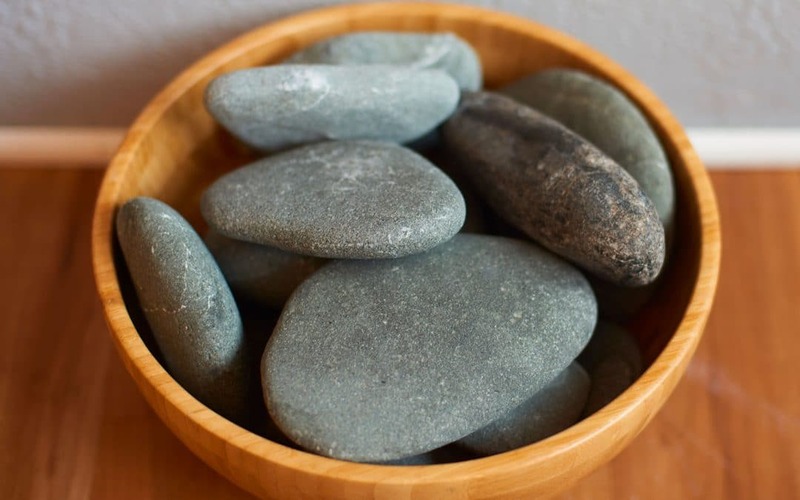 The classical texts of Tibetan Medicine state that hot stones compress functions to immediately reduce pain, expel cold stagnation, stiffness and promote circulation. Hot stones are especially indicated for stubborn, chronic orthopedic pain. Another common therapy is called horme compress. The horme compress is small bundle of herbs (caraway and/or nutmeg), soaked in warm oil and applied to specific points. This very warm natured treatment is excellent for balancing the air element loong energy. As such, it is used for symptoms including anxiety, depression, insomnia, lightheadedness and agitation. Horme compress also helps sharpen the mind, benefits the heart and clears the senses. It is a very relaxing and effective therapy. Cupping is the application of cup-shaped instruments to the soft tissue areas of the body, using reverse-pressure suction. Traditionally, Tibetan Medicine practitioners use beautiful copper cups with fire-induced suction. In modern practice we often use simple glass cups with a suction gun mechanism, for the sake of expediency and convenience. This treatment is a little less gentle and can result in temporary discoloration or bruising at the local site. Cupping is great for reducing pain in the muscles and soft tissue caused by stagnated blood and inflammation. This is very helpful for pain and stiffness associated with over-worked muscles and tension-holding patterns. The classical texts of Tibetan Medicine list a variety of indications and benefits of Kunye Massage. Some of these traditional indications are described below. In Traditional Tibetan Medicine it is purported that regular Kunye Massage promotes general health and long life. The effects of massage are holistic, benefitting all of our bodily systems and promoting homeostasis. By integrating Kunye massage into our routine of self-care, we can relax in the knowledge that we are supporting our health and promoting long-life. What better motivation for taking the time to regularly receive a great massage? The classical texts specify that Kunye massage is very beneficial for geriatric people. Older people commonly suffer from a variety of complaints for which Kunye is indicated. This is because Kunye is warming and invigorating. It stimulates blood flow, loosens stiff joints, promotes sleep, benefits digestion and facilitates the memory. Kunye is great for your skin. Massage with oil hydrates and nourishes the skin and muscles. It stimulates the flow of blood and vital fluids. Also the use of herbal compresses and medicinal baths can be very effective for some specific skin conditions. In Tibetan Medicine when we say “rough body”, this can also mean that the body is depleted and could use some nourishment. Kunye invigorates our strength by stimulating the metabolic heat. Our metabolic heat enables us to properly transform food into healthy bodily substances like the blood, oils and fluids that keep our skin healthy and vibrant. Our strong metabolism also transforms and expels waste products so they do not stagnate and impact our health. That is why healthy digestion and strong metabolic heat are essential for healthy skin and a clear complexion. Kunye is beneficial for digestive health, especially for cases of chronic constipation. It promotes the clearing of metabolic stagnation and invigorates our digestion system. Certain special points and techniques in Kunye are very effective for stimulating peristalsis in our large intestine. These effects relate to the function of our descending loong, the energy that moves waste products downwards for elimination. That is why for constipation and other digestive complaints, Kunye is traditionally indicated. Chronic fatigue and other long-term health challenges over time can tax our bodily resources. This can deplete the strength of our blood, fluids, and vital essence. The deeply restorative effects of Kunye massage mitigate the harmful toll of stress and fatigue. This is why the classic texts of Tibetan Medicine suggest using Kunye to restore from any condition of fatigue, exhaustion and for recovery from chronic disease. Kunye is very effective for calming anxiety, mental and emotional stress. When we are under stress we experience a rapid increase and agitation of our air element loong energy. We feel all the diverse symptoms of stress and anxiety as our mind drives our nerves into sympathetic mode. In Kunye we work with specific points on the body to balance the loong, calm the mind and nervous system. During stressful times it is ideal to get extra rest and nourishment. Of course this is not always convenient or possible during stressful situations. So taking a little time to receive Kunye is an efficient way to restore and balance your energy in a short time. Our sleep patterns are very much related with the air element loong energy. The loong regulates every aspect of our mental and emotional health. When our thoughts are racing and our minds are over-taxed, the loong energy becomes very agitated. We experience many symptoms from overactive loong, including insomnia. Kunye works directly to calm the loong, and switch our mind out of those stress patterns of over thinking and anxiety. So Kunye massage and gentle therapies are helpful for improving our sleep health. Applying Kunye, especially to the head and face, can help sharpen and clarify our senses. This method is effective for relieving nasal and sinus congestion. It promotes the healthy flow of blood and fluids to our eyes. It can relieve tensions and stagnations that dull our senses and cloud our minds. Kunye can benefit our digestion and harmonize the flow of loong to our upper body, head and sense organs. Balancing our air element loong energy is essential for health and happiness. In Tibetan Medicine we say that the loong is like a sensitive, crying baby who always needs to be comforted with a little extra care. With its warm and nourishing effects, Kunye functions like a blanket and a bottle to calm the agitation of our air element loong energy. By relieving stress and calming internal agitation, we can get back to laughing, playing and sleeping like a baby. Maintaining the health and balance of our body, energy and mind is a full-time job. Tibetan Medicine teaches us to always pay attention to our diet and lifestyle to avoid developing long-term problems and optimize our health. We should invest in our “self-care”, listen to our bodies, and develop healthy habits to help ourselves out whenever possible. Kunye massage is an effective tool to support our health and promote long life. Nobody enjoys the effects of stress and fatigue. The good news is, with the rejuvenating, restorative effects of Kunye, we can promote our health and balance in an enjoyable and rewarding way. I find your article very interesting with many important details. I wish you had a practice in Massachusetts or knew someone as educated in the topic as you ar who practices in the east coast. Bloom Traditional Tibetan Wellness and set up a consultation.